On November 6, 2018, at approximately 3:30 a.m., police fire and rescue personnel responded to Lockes Hill Road and New Market Turner Road, in Mechanicsville for the reported serious motor vehicle accident with one person trapped. 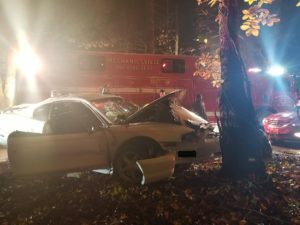 Crews arrived on scene to find a single vehicle off the roadway and into a tree, with one patient confirmed trapped, and three patients out of the vehicle. Firefighters immediately requested a helicopter due to the patients injuries. After approximately 5 minutes on scene, firefighters extricated the patient from the vehicle, and learned all helicopters were down due to weather. Three patients were transported to an area trauma center by ambulance and one patient signed care refusal forms on the scene. The St. Mary’s County Sheriffs Office are currently investigating the crash, and updates will be provided when they become available. This entry was posted on November 6, 2018 at 6:51 am and is filed under All News, County, Fire & Rescue, Law Enforcement, St. Mary's News, Top News, z 600X120 Top Ad Bottom, z 600X120 Top Ad Top. You can follow any responses to this entry through the RSS 2.0 feed.